IT has taken 11 years of unpaid hard work and big financial support from himself and his late wife, Shirley, for Stuart Buchanan to rebuild the Bustard Head Lighthouse Station north of Bundaberg. It was officially dedicated in March when Buchanan finally achieved the last step in his ongoing crusade to rebuild the lighthouse station ... opening the refurbished lighthouse tower to the public. If it hadn’t been for Buchanan’s hard work over the past 11 years, to say nothing of his seemingly endless fights with bureaucrats and the occasional environmentalists over that time, Bustard Head would today consist of the lighthouse surrounded by heavy bushland. That was the government plan when lighthouses across Australia were de-manned and became automatic. The two vandal-destroyed Bustard Head lighthouse keeper's cottages would have been removed along with the four work sheds and the surrounding area allowed to grow back to bushland. But today the cottages and sheds are in prime condition thanks to three years of endless work by Buchanan and great help from another lighthouse keeper, Dudley Fulton, over the past year. Buchanan opened the lighthouse to the public for the first time after finally gaining permission. I was up there and the inside of the lighthouse is bright and beautiful like the rest of the surrounding buildings, no doubt as good as it was when it became the first lighthouse on the Queensland mainland in 1868. It has become a major tourist attraction, with LARC vessels taking people from Town of 1770 (37km south), several times a week. The tourists are taken all over the headland but the major attraction is a visit to the museum, established in the front cottage by Buchanan. The payment for the museum tour is the only money that comes into the Bustard Head Lighthouse Association, managed by Buchanan. At the start of the redevelopment in the early 2000s Buchanan’s late wife Shirley donated $130,000 to the association. And when my old sailing mate Stuart, Dudley and my wife, Jan, and I went up to the station in March, Stuart sprinkled Shirley’s ashes across the fields from the lighthouse tower. Why did Stuart spend so much time rebuilding the light station after it was destroyed by vandals in the mid 1990s? Because he was the lighthouse keeper there with Shirley for five years. They loved the place and Shirley was totally supportive for Stuart to rebuild the station. When he finally defeated bureaucrats to start work on rebuilding the cottages, Buchanan moved up there, living in the totally destroyed front cottage, sleeping on the floor in a small tent as the rain came pouring through the destroyed roof. At the start of rebuilding Buchanan had plenty of volunteer workers. But that all changed after a few months because he was too hard a worker and expected the volunteers to do the same. Stuart worked from daylight to after dark seven days a week and soon found out that volunteers weren’t as tough. After the first few months he was working by himself. I used to go up for a week or two every couple of months and could put up with him because I used to sail with him on his yacht, Pluto. One time I arrived there for a couple of weeks and found Buchanan looking like death warmed up. He was still working alone, daylight to dark. I insisted he get on the LARC which brought me up and go and see a doctor at Town of 1770 or Agnes Water. He came back the next day still looking crook because he had Ross River Fever. He started taking the doctor’s pills and kept on working daylight to dark. He spent almost two years working mostly alone until another former lighthouse keeper, Dudley Fulton, joined him. They got on very well because they are both hard workers and love lighthouses. After three very hard years, Buchanan finished rebuilding the light station with great help from Fulton for the last year. If you want to make a day visit to Bustard Head you can get it through Town of 1770 LARC tours. It’s a great day out. YOUNG blokes and sheilas surfing today probably wouldn't believe it but when I started surfing in the mid 1960s, when you fell off your board you lost it - straight onto the beach if you were lucky, or straight onto rocks if you weren't. You see back then the legrope hadn't been invented, although I saw a big fat bloke roped to his board at First Point, Noosa, about a year before the real legropes appeared. It was a good surf day and I was paddling back out to the point after a pretty good wave when I moved past the fat bloke and noticed a dirty big rope tied around his gut. The rope was about an inch thick and disappeared under his board. I found out later he had it tied to his fin. About a year later proper leg ropes hit the market. They were great days back then, with very few surfers compared to today. I surfed mostly on the Sunshine Coast - the North Coast as it was known then - and you knew most of the surfers out there. 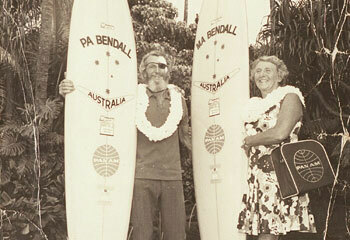 Two of the most popular surfers back then were Ma and Pa Bendall of Caloundra: Marjorie and Ben. They were among the first boardriders up there in the late 1950s. Pa had seen films of people riding boards with fins, able to twist and turn their boards up and down, not just go straight in with the wave like the finless boards of old. Pa reckoned this new sport was for him so he got a couple of planks of balsa and carved out a board for himself and one for Ma. As far as I can recall they were the first surfers in Caloundra and their favourite break was Moffat Headland, where Ma dropped Pa's ashes when he died in 1973. They sure were funny days back then because Ma and Pa used to leave their boards up against the Moffat rocks for days at a time when they weren't using them. I don't think you could do that today. Pa was a Canadian airman and performed pretty well during the Second World War. But this is about Ma, a highly intelligent and very brave woman and a bloody good surfer for a woman who didn't start until she was in her fifties. How brave was she? Well a couple of weeks before her 89th birthday I asked her what she would like for a birthday present. She wanted to jump out of a plane and parachute down to her beloved Moffat Beach. No kidding. I made the booking but a couple of weeks before the birthday Ma had a heart attack and spent a few days in hospital. When she got out of hospital she begged me not to tell the doctor about the parachute jump. "No, don't do that," Ma scolded me. "He won't even let me ride a horse when I go to New Zealand for a holiday later this year, so he won't let me go parachuting." But when I took Ma to meet the parachute instructor he refused to take her because of her age and her recent heart attack. Ma was dirty but settled for a joyflight up and down the coast in a light plane. Ma had always been adventurous ever since she was a child born and brought up in the Queensland bush during World War I. As a bush kid she was mad about flying and her early heroines were those three marvellous women pilots: Amy Johnson, Amelia Earhart and Nancy Bird. At the age of 23 Ma was the only female among 140 people to enter a newspaper competition offering a flying scholarship as the sole prize. She made the final six. Several years later Ma posed as an Australian journalist to bluff her way into the BBC's London studios for a private interview with her heroine Nancy Bird, who had just completed one of her historic flights. In 1935 Ma, aged 25 and single, sailed to England for a six month trip which turned into almost five years, during which she realised her ambitions to ski the slopes of Europe, hunt with hounds, shoot grouse and fly-fish for trout. She also saw the rise of Hitler from the inside, working as au pair for a Jewish family in Germany in the late 1930s. Later she took au pair work in Sweden where she skied the frozen wastes near the Lapland border. Back in England she became engaged to her first husband, Bill, who gave her a good hunting horse, instead of the more traditional engagement ring. Her wedding present was only slightly more unusual: Bill's family gave the happy couple a brace of guns, including a 10 gauge shotgun for her and a 12 gauge for him. In 1939, the newlyweds caught a steamer to Sydney where they set up home in Mosman. The marriage ended in divorce and the mother-to-be Ma returned to Queensland for the birth of her daughter in 1940. That same year she moved to Caloundra where she bought a block of five flats at Bulcock Beach. In the mid-1950s, along came the irrepressible Canadian Air Force pilot, Ben Bendall. Like Ma, Ben was an outdoor fanatic and when, later that year, they saw a young bloke riding a balsa plank across the waves off Moffat Headland, they were hooked. Ben made a rough copy of that surfboard and so began their life of surfing. Ma told me back on her 89th birthday: "I was 50 and Ben a couple of years older when we learnt to surf. We started travelling a lot and competing in surfing events around Australia and pretty soon we became rather well known." They were invited to compete in such prestigious events as Hawaii's Makaha contest. They became media celebrities with frequent TV appearances. Their surfboards, as well as the films and books they created, are held in various surfing museums. They have a surfing contest named after them: the Ma and Pa Bendall Memorial at Caloundra, the second longest running professional contest in Australia, still going strong after 38 years. 1. You can do anything if you really want to. 2. Never miss an opportunity for the good. 3. They say? What say they? Let them say! The great Marjorie "Ma" Bendall died in 2001 aged 91 years. What a wonderful woman and a wonderful life. ALTHOUGH I moved from Maryborough to Brisbane to join The Courier-Mail in 1956, I never visited Noosa until 1960. Sure my wife Jan and I had a couple of holidays on the Sunshine Coast in a Caloundra flat before that, but we never travelled farther north. By the way, it wasn't the Sunshine Coast in those days. It was the North Coast and the Gold Coast was the South Coast. In 1960 the editor, T.C.Bray, a tough but great bloke, moved me from Police Rounds reporting into the Sports Department to cover rugby league and tennis and a few other sports and I wasn't too happy about it because I loved chasing crime, fires and accidents in Police Rounds. Soon after the transfer I was asked to cover a surf lifesaving carnival at Noosa because the regular surf lifesaving writer, the late Frank O'Callaghan, was away. So off I went to Noosa for the first time. It was a bit different back then compared to today. Hastings Street had a caravan park at the southern end where the cop shop is today. At the other end was a very rough camping ground and the mouth of the Noosa River was only about 100 metres from the end of Hastings Street. On the beach side of Hastings Street were a couple of small shops and a row of old weatherboard houses and huts and a couple of weatherboard guest houses. I stayed in an old boarding house on the beach that time and I think it cost five shillings for bed and breakfast. That's 50 cents today. The only pub in town at the time was up Noosa Drive from Hastings Street on top of the hill. It had fantastic ocean views up towards Double Island Point. But it had to be a certain time to be able to view it - like when you had a few beers and needed a wee-wee. You would leave the public bar, which had four walls and no windows, walk across the room to the toilet, step up to the urinal, and let fly while looking out the window. And what did you see while having a pee? Fantastic views overlooking the old houses and shops in Hastings Street, across the beautiful beach and across the beautiful sea up north to Double Island Point. When you finished, you left the beautiful views and walked back into the closed-in public bar. It's all different today, of course, and if I had any luck I would be able to stay there for free today because my old surfing mate, former Courier-Mail reporter Ian Oliver, would have been the owner. You see Ian's parents went close to buying the pub back in the late 1960s but preferred a pub out Warwick way. There was some excellent Main Beach surf that day in 1960 and a few board riders out around First Point at Johnson's Bay. Remember back then there were very few boardriders around because surfboards with fins had only been introduced to Australia by some Yank athletes who were in Australia for the Melbourne Olympics in 1956. Seeing them got me interested in surfboards, and a couple of months later when Jan and I were holidaying at Caloundra, I decided to visit an old Maryborough swimming mate, a former Queensland Railway lad porter named Hayden Kenny. Some time earlier Hayden had opened his board-making business at Mooloolaba. I borrowed a board, about 10-foot long, which was the normal thing back then, and drove back to Caloundra. That afternoon I launched it into six-foot surf at the southern end of Kings Beach and paddled out. I paddled like fury onto the first swell that came along and took off like a rocket but before I could get up the board speared into the sand, shooting me off like a rocket and almost breaking my neck. I took the board back to Hayden next day and told him I was retiring from surfing. But all that changed two years later when I met old surfer Ben "Pa" Bendall and his wife, Marg "Ma" (pictured above). But I'll tell you about that another time. Anyway after the Noosa lifesaving carnival ended, I phoned the story back to The Courier-Mail and decided to walk around to National Park. When the old bush track to National climbed up over First Point I was astounded by the views from that fantastic rocky point. I sat down on the point for quite a while, watching the sun go down ... and the great surf with about three or four boardriders out. You must remember back then there were so few boardriders around that when you passed a car with a surfboard on top you waved at them frantically and they did the same to you. That spot at First Point became my favourite spot. I even camped there in my swag a few times. Then one day driving up to National all hell broke loose in my head - there were builders on First Point constructing four bloody units. You can't, I told them. This is part of National Park. Unfortunately all us surfers had believed that but it was not correct. So up went the four units, and I hated it. But if I had a couple of million bucks today I would buy one and move in. They have the best ocean views in the world. Even though I hadn't started boardriding at that stage I started spending holidays at Noosa, sometimes with Jan and sometimes with mates in old beach-side houses. The best of those was in an old weatherboard house named Rainbow's End, right on Johnson's Bay on a triangle of land where you turn off Park Road into Little Cover Road, just across the road from where those bloody First Point units are today. THE ageless watchers on the bank would have heard us puttering up river long before they spied Heather, Hugo and me stepping from the dinghy into the pitch-tar blackness of a Cape York Peninsula midnight. We clattered about in muddy, knee-deep water dragging the ancient tinnie and its battered outboard up the bank from which, mere seconds before, the watchers had slid stealthily beneath the Olive River to do whatever it is crocodiles do when unaccustomed things go bump in their night. For about 10 months of the year Hugo Julcher, 65, and Heather Schlaegl, 58, share that little section of Temple Bay, near the tip of Cape York, with about a dozen resident crocodiles and God only knows how many local snakes and transient sharks. So my guess is that Heather and Hugo not only would have seen the two watchers on the bank in front of their shack as we approached out of the night but most likely would have known them by first name. You see, their's is but a small, exclusive colony of crocodiles with almost daily eyeball-to-eyeball contact on the banks and in the water that rushes past their front door ... make that their front half door, because half a front door is all there is to this home away from home, probably the least luxurious shack I have encountered since visiting black townships in South Africa in apartheid days. Most of the building material has come from combing the wide, white beaches within easy walking distance of that lonely shack about 180km south of the tip of Cape York. Material like the sail which makes up the eastern wall and the railway tarp that provides about half the roof, fishing net, the flotsam and jetsam, the odds and ends that have been turned into just about every stick of furniture in the place. Sure, it doesn't sound much, but it's a dream home to this amazing couple, a 10-month-a-year haven from the rat race of Cairns where Heather owns a small block of units. Maybe it was the excitement of coming home to this tiny, often damp outpost in the wilderness that caused them to overlook formal introductions between myself and the reptiles but they failed to mention them altogether as we disembarked. Thus fortified by their lack of concern about deadly creatures of the night, I stumbled through the water, the mud, the bush and the blackness helping unload their meagre provisions. This finished, we each had a can of beer to ward off the tropical swelter, I flashed off a few photos of them filling a chaff bag with black-lip oysters from the spot so recently vacated by their evil-eyed neighbours, and returned a mile out to sea to board my transport to Torres Strait, Jardine Shipping's mother ship, Torres Express. It was only next day that a Torres Express crewman, who had been following our dinghy up the Olive the previous night with more stores, mentioned the crocodiles just a few metres from us which he had clearly seen in his spotlight. There was a torch in Hugo's tinnie but after about 20 years fishing and living around the Olive, he doesn't need spotlights, or any other new-fangled contraption for that matter, just his instincts. Well, that's not entirely true. He and Heather have a generator that works a frig and a dim light. They also have a transistor radio which receives the ABC at night and first thing in the morning but not during the day. As well, Hugo made a giant technological leap into the future this year when he purchased an EPIRB, an emergency radio beacon, which can beep out an SOS in case of an emergency. Before this historic event, all emergencies at that Olive River outpost were tackled first-hand. That's the way they do it up that way. If you get crook you look after yourself until you get better ... if you get better. Seven years ago I was swigging rum (medicinal purposes only, mind) with one of the Cape's pioneer cattlemen, the late Rod Heinemann, at his station, Bramwell, about 50 inaccessible kilometres west of Hugo's shack. Old Rod, well into his eighties then, mentioned one of his worst times on The Cape, being bitten by a redback spider out on the track with a mob of cattle and miles from anywhere. "I was pretty crook and had to lie down for a fair while," said Rod as if he was yarning about the bloody weather. "But I came good in the end." Do they make 'em like that anymore, I wonder? Hugo Julcher is of the same vanishing breed - tough, independent, adventurous. If you were around in post-war years you will remember the type. Thousands of them came out here after the second war from all over Europe seeking work but looking more for adventure. They couldn't speak the lingo too well but they worked hard and played hard and won a lot of respect for that, as well as with their devil-may-care attitude and their mitts. Hugo hit Australia from Austria in the early '50s on a promise of work in his trade as a cabinet maker but it wasn't available when he arrived and that sort of sent him off on a tangent. Since then he's worked in every state at just about every job you care to name, including buffalo shooting in the Territory. He even has a kindly cop to thank for dragging him out of a Melbourne gutter one time and sending him to a friend's farm up country to dry out. He still doesn't mind a drop in the morning, the afternoon and the night, but it gets awful dry on the Olive River when his meagre supply runs out after the first couple of weeks. Supplies simply don't come in because there is no way to order them, so they take what will last longest when they catch the mother ship, Torres Express, on its first run of the prawning season from Cairns to York Island in Torres Strait. When it has travelled close to 700km north from Cairns, Hugo and Heather climb into their loaded tinnie, day or night, rough or smooth, putter a mile or so from the mother ship across a dangerous bar, and hey presto! Their paradise opens up. The crew in a following dinghy unloads the rest of their supplies and that's often the last they see of another soul for two or three months. About 10 months later they catch the Torres Express on its last run of the season and rejoin the rat race for Christmas. Occasionally they have unannounced visits from passing fishermen, yachties and some of the strangest wanderers imaginable. Several people in kayaks have dropped in on their circumnavigation of Australia. Others have come in on 14ft catamarans like the one I sail in Bribie Passage. I'm mildly adventurous, not raving bonkers, see. A bloke wearing a sarong and calling himself "Victor the Nomad" sailed up the Olive some time ago in a most incredible craft on his way to New Guinea where, he told Heather, he "just wanted to love people". Someone farther down the coast had given him a near-wrecked 12ft tinnie. He patched it up, found a piece of blue plastic tarp for a sail and headed north with no rudder or centreboard. The last Heather and Hugo saw he was sailing wonkily in the general direction of New Guinea. They believe we was taken into protective custody a little farther up the coast, somewhere about Thursday Island. Another time a Yank calling himself "Friendly" wandered in off the beach. He was walking up the coast to Bamaga from who knows where. "Everything he owned was in a small sugar bag," said Heather with the wide-eyed surprise you would expect from someone trying to explain away an elderly couple who live with crocodiles way up Cape York for the hell of it. "He didn't have any food. He was living completely off the land. He said hello and had a bit of a talk then headed north along the beach." As "Friendly" disappeared into the shimmering northern haze, life returned to workaday normality for Hugo and Heather on the Olive River. That includes a lot of time beach combing, looking for bush tucker, fishing and crabbing, although crabbing is a mite unconventional. Crab pots and dillies are out because the crocs gobble 'em up getting at the bait or the crab. So Hugo sinks fish frames in shallow water near the bank and when the muddies appear for a feed he spears them. And you won't believe what this incredible duo do with those delicious giant black-lip oysters. They use them for fish bait because they're tired of eating them. "It's not hard to get tired of oysters if you eat too many," Hugo said. "But they're very good bait. "They're tired of barramundi too. Just too many of the bloody things in the creek. "I've gone right off barra," Hugo said. "Give me mangrove jack any day." They have an amazing selection of bush tucker (pictured) in the district including fruit and nuts from a variety of natives like currajong, lillypilly, wild grapes, passionfruit and especially coconuts. They get the sweetest of fine honey by whipping grevillea blossoms on to plates. They also grow what vegetables they can. Hugo has a great recipe for fish cakes mixed in with roughly grated fresh coconut. He also has some great recipes for the occasional feral pig he bowls over. In fact, Heather and Hugo could probably teach the Bush Tucker Man a thing or two about scrub cuisine and thought they were about to be so invited when the man himself, Les Hiddins, turned up at Heather's Cairns units a couple of years ago. But he was more interested in details of a RAAF fighter pilot who crashed his F18 just a couple of miles from their Olive River shack. Much, much earlier Heather and Hugo had given RAAF search parties information about a strange noise they heard at the time the plane went missing, but as is often the case, the advice appears to have been overlooked. When the crash site was accidentally discovered a couple of years later it was just about where Heather and Hugo figured it would be. They don't miss much, the people who live by their wits in the wilderness, and that particularly goes for what most of us regard as the comforts of home. Maybe you'd like living in a colony of crocodiles where you get to know the neighbours on a first name basis. But think twice because it's like Hugo told me when inviting me to stay for a week or two - you don't have to be mad but it's an advantage. The unusual pair aren't living with crocodiles these days because Heather died back in Cairns a few years after I met her, but Hugo kept going back to his lonely hut for several years. Then, in the early 2000s, he just disappeared from his lonely hut on the Olive River. There is no prize for guessing how he met his maker.